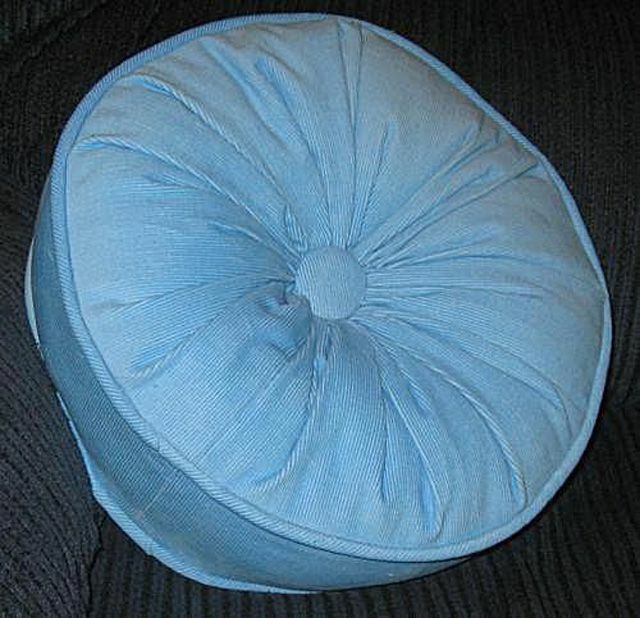 This round pillow will add a designer touch to any furniture in your home. Play different fabrics and with gathering and pleating the centers to create different effects. Make a grouping of throw pillows using the many free patterns for different style pillows. 1 1/4 Yards of Fabric (2/3 of a yard if cut on the crosswise grain) - The pillow shown here was made with corduroy. If you are using soft fabric, consider using fusible interfacing on the side piece so the sides remain straight. Stuffing - A quality filling material will stuff the pillow without lumps. 1 1/3 Yards of Fabric (2/3 of a yard if cut on the crosswise grain) - The pillow shown here was made with corduroy. If you are using soft fabric, consider using fusible interfacing on the side piece so the sides remain straight. A long sturdy hand sewing needle that can go through all layers at the center of the pillow. Whenever you are cutting out square or rectangle pieces it is advisable to use a tool that will assure that your pieces are cut truly square. Rotary cutting tools help assure that the pieces are square. 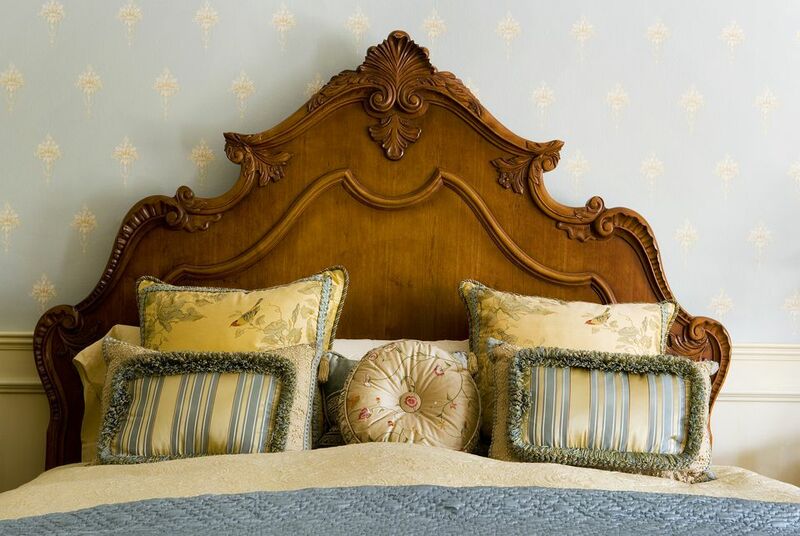 While cutting out the pieces for these pillows, cut the length of the pieces on the lengthwise or crosswise grain of the fabric depending on how much fabric you have and the desired effect of the fabric details. For the Front and Back of the Pillow - Cut two 7" by 38"
For the Front and Back of the Pillow - Cut two 8" by 45 1/2"
All directions will be using a 1/2" seam allowance. Cover the buttons using scraps from the cutting process. With the right sides of the fabric together, bring the shorter edges of the cut sections together on all three strips of fabric. Pin the shorter edges together aligning all the edges. Sew a seam across the shorter edges using a 1/2" seam allowance. Press all seam allowances to one side. Sew piping to both long edges of the side pieces. With the right sides of the fabric together, bring one edge of a front or back piece to a piped edge of the side section. Match the seams and align the edges. Sew the front or back section to the side section, using a 1/2" seam allowance. Repeat for the remaining front or back section, attaching it to the remaining side piece edge. Sew a seam finish to the seam allowances and to the un-sewn edges of the front and back pieces. Hand sew a running stitch on the unattached front or back section, using heavy duty thread. Gather the edge together as tightly as possible by pulling the running stitch thread. Secure the thread by sewing a couple of stitches. Sew in a cross pattern to bring the edges together, repeating until you have closed any gap in the center. Repeat sewing the running stitch on the other front or back section of the pillow. Begin gathering that edge but do not secure the stitching. Stuff the pillow, pushing the stuffing out to the edges until you are happy with the firmness of the pillow. Draw the gathering together and secure the edges in the middle as you did the first side. Sew a covered button to that center. Draw the thread through the center of the pillow to the other center. Draw the thread thigh to bring the centers together as much as possible. Sew the remaining covered button to the opposite center. Knot and cut the thread once you are comfortable with how tightly the centers are drawn together.